Broadhead Journal #10: "I’m in hell. Literally. I suppose I deserve it. I wish I hadn’t broken the party VR, but I didn’t have a choice if I wanted to help the Heechee AI destroy the Assassin. Now I’m paying for my choices and I’m not even allowed to die." As they say, "out of the frying pan into the fire." This time it's almost literal. I'd just destroyed the Assassin's distraction through VR contradiction. The destroyed party scene dissolves into a new VR scene, a conversation with a huge demon who threatens me with eternal torment instead of pleasure and then throws me into a flaming hydra lair. How many ways can I find to die? I'm definitely regretting extending my last play post at this point. See, my previous post was spent running around making useless conversation with dozens upon dozens of bad spoof characters to pop culture. It generally involved too much insanity to actually be swallowed in one sitting. Inversely, this time around was the new island of 'Paw' – or as I thought of it mentally, 'Egypt-land'. 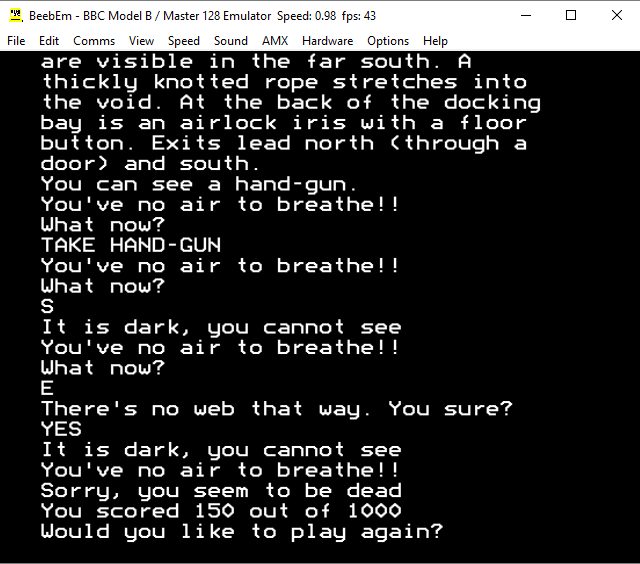 The parallels to Westworld would be far cleaner in this instance were the game just slightly better grounded in anything – reality would be nice, but I'd even settle for something as steady as pudding at this rate. There are a total of six NPCs within this island, counting the genie who can trick you into a bottle and the Japanese photographer (stereotypes, ha ha!) who will then save you from it if you make the mistake of taking his offer of 'all of the genie's power'. It's as though they ran out of ideas for characters to speak to, and just figured 'eh, we'll put all of the game's puzzles here instead'. After exiting the airlock leading out from freezer units, I first encountered a long cylindrical tube, with another airlock at the southern end. Continuing north from this second airlock, led me inexplicably to another cylindrical tube, situated under the first tube - I could climb from the lower tube to the upper tuber, but for some reason I couldn’t climb down from upper to the lower tube. I at first tried to to open southern airlock. I came into a docking bay, and I was promptly told I had no air to breath. I could still move for a while. First, I entered some dark area and then I found myself floating in space, and finally, I died. Since we don’t want to exhaust Joe with his marathon, we’ve given him some time off. 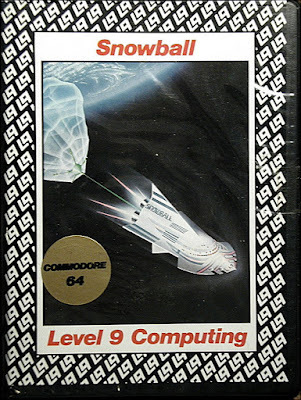 In the meantime, I’ll take the opportunity to continue the story of Level 9, a text adventure company founded by the Austin brothers and known affectionately as the British Infocom (yes, this is going to be a sideshow). As those familiar with my earlier reviews of Level 9 games might remember, I have been less than enthusiastic about their games. We’ll see if Snowball fares any better. At least it is a change from their earlier, Tolkien-themed works and foreshadows nicely Joe’s upcoming Starcross-posts. So, is that a giant net for catching space fish? Broadhead Journal #9: "Seriously, we’re not done yet? Now I’ve got to go activate the whole shield system because there’s a control center at the Vertex in the same star system as the Assassin’s watchtower. If the Heechee had just activated the thing in the first place, this wouldn’t have been necessary." I'm almost ready to trigger the fourth shield generator, but I still need an actuator cell to fix the controls if I don't want to dig up the one buried by the trailhead. Getting the actuator cell out of the wreckage is a rather delicate operation, involving multiple tools and quite a lot of technobabble. I'd poked around earlier and saw that the actuator panel looked relatively intact, but was secured with grommets that I couldn't remove. I examined everything again and this time saw that the maintenance crib could be opened, so I did that and found a flange defuser and a grommet wrench. Now I should be able to do this. Eternam is getting to the point where I repeatedly ask myself a simple question: 'why?' The problem is the direction of this query. At first, it was 'why would the developer do this'. This is actually a fairly common question as I look into games, particularly with a critical eye turned towards things given the relative age of the games we're playing here. Using the 'latest technology' at the time is often the explanation for a relative drop in quality (e.g. the FMV revolution to truly kick in some time soon on this blog). I'm past asking that question, as the answer to that is simply not one I have the capability to understand. I don't operate on that 'either crazy or genius' level and likely never will. The question I'm now asking is 'why am I even playing this?' Even with the impetus to complete the game for the blog, I'm struggling heavily with that question. The other bad games I've played here have at least had the saving grace of being short – this feels like it's gone on forever already! There are things that make you appreciate other, finer things. One might read Hamlet and find that they're encouraged to watch it as a live play, making their appreciation for the artistry of the performers that greater. Eternam on the other hand makes me long to read Twilight for its incredibly deep and emotionally strong female protagonist. Hello, sailor! Last week, I started into Zork III, the final chapter of the original Zork trilogy, and explored much of this new region in the Great Underground Empire. I discovered an ancient aqueduct on an icy lake, a “scenic vista” that could teleport me into previous (and future!) Zork games, and battled a mysterious man in a land of shadow. The game has been fun so far, but more melancholy than previous outings. There are no inept wizards or sneaky thieves here, only monuments to a dead civilization. I have a bunch of puzzles to solve on my way to the Dungeon Master and I need to get cracking. But where should I start? I don’t feel like I’ve made it through any part of this game completely and the structure makes telling a cohesive narrative of play challenging. Just like I did way back on Dungeon, I find myself bobbing and weaving back and forth between puzzles to discover which one I can crack first. Adding to the difficulty, the score in this game is worthless. There are only seven points in this game. Seven! Worse, these points seem to be awarded based on puzzles found rather than ones solved; I spent a chunk of today’s post with a full load of points but nowhere near victory. Let’s play! Broadhead Journal #8: "Three down, one to go. How much worse could it get? This last one is habitable at least. And I’m not the first one to end up here, either, although from the look of his ship, the other guy might have met a messy end. I’d better keep my eyes open as I look for the shield generator." Before I go to the last shield generator planet, I decide to follow up on the repairman's clue about someone doing something interesting at midnight on Level Babe. There's not much there, just an east-west corridor with blue Heechee metal at both ends. One end also has a large shipping crate that I can hide inside, so I hide and wait until the appropriate time. A scientist named Gordon Perry appears and hits an artifact on the Heechee wall, making a pure tone. Sounds like another tuning fork! 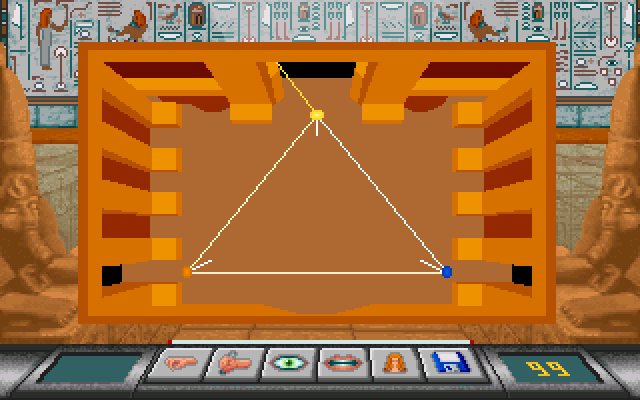 He puts the artifact into the blister and then does something I can't see from the crate that causes a portal in the wall to form. As he passes through, he conveniently drops a slip of paper. I run out and get it  and then hide again until he passes through again and disappears down the corridor. The paper contains a five-digit numerical code. You can't tell in this picture that I'm hiding inside a crate. Out of the crate and duplicating what Perry did. Eternam - Parlez vous francais? 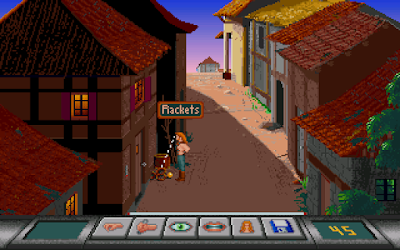 I've probably spent more time ragging on France and its bizarre adventure game design choices than I'm probably allowed without becoming known as an enemy of the state. I mean, I live an awful distance from France anyhow, so I could probably continue with impunity, but that's not to say that I should continue to blithely fire away for no good reason. Eternam has provided some laughs. I can't deny it, there's been an occasional snort here and there. The game has so many flaws that they're just not worth the laughs, though. When I was (far too young to be playing) Leisure Suit Larry 3, I found the same issue that could easily have dogged my progress in this game. See, not only does this game have its bizarre first person map issues, but in the more traditional 'adventure game' pieces of the game, it's very easy to fail in finding exits from rooms. On the main map, we're playing Space Invaders..
Broadhead Journal #7: "No $(*# way. I go from a beautifully relaxing planet to THIS? Every single thing here is trying to eat me, even the plants! And they’re all disgusting! I hate this place. I’d better get all that money they’re promising." 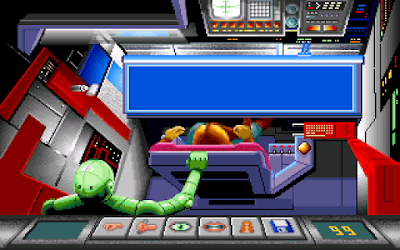 I started out this session by working on the fourth shield generator world, but I got a bit stuck there too, so I decided to solve puzzles on the station first, which I probably should have done earlier. The consequences of stealing from the museum. Last month, we completed the third game in our Zork marathon: Zork II. After exploring the prehistory of Infocom, we have finally reached the point where they are starting to fire on all cylinders. They even had a new office in beautiful Cambridge, Massachusetts! 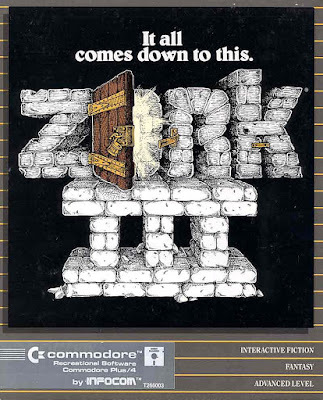 Zork II may not have been as solid a game as its predecessor, but it was very good and the company was banking on many sequels. As 1981 turned into 1982, they had three games in the pipeline under pre-production titles: Zork III, Zork: The Mystery, and Zorks in Space. 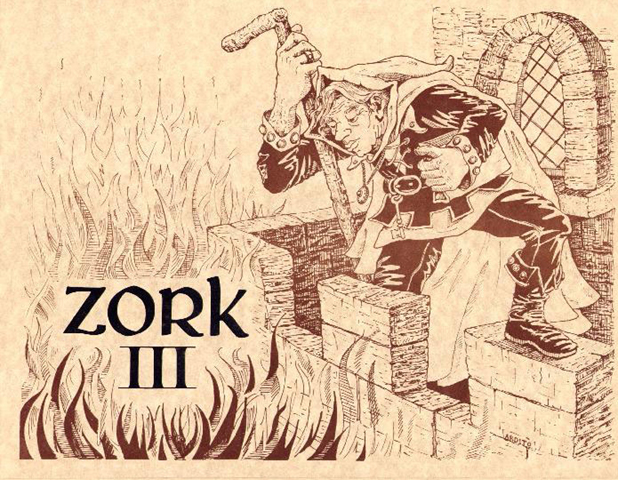 These games would not only continue in the Zork tradition, but also prove that Infocom’s text adventures had legs far beyond their initial fantasy romps. The mystery was released as Infocom’s third game, Deadline, preceding Zork III and Starcross (the space adventure) by several months. Despite the early title, Deadline does not have any connections to the Zork universe and so will not be covered directly in this marathon. Ilmari already wrote an excellent review of that game almost exactly a year ago, but I wanted to experience that game for myself before continuing on to Zork III. I have put together my own review of Deadline as a special bonus post which you can find here. Please check it out! Zork III and Starcross were released simultaneously several months later. We will cover Starcross as the next stop on the marathon thanks to a pointer that it may have a connection to the Zork universe after all. As in the previous Zork games, this one is credited to both Marc Blank and Dave Liebling. Also as before, there is no mention of their mainframe collaborators in the credits. It is generally believed that this was Marc’s primary focus while Dave was working on Starcross. As Marc was also the lone developer on Deadline, this must have been a busy year! Beyond that, there’s not much history to tell. While Deadline had feelies, the original 1982 edition of Zork III did not have the extra manuals that many readers remember so well. 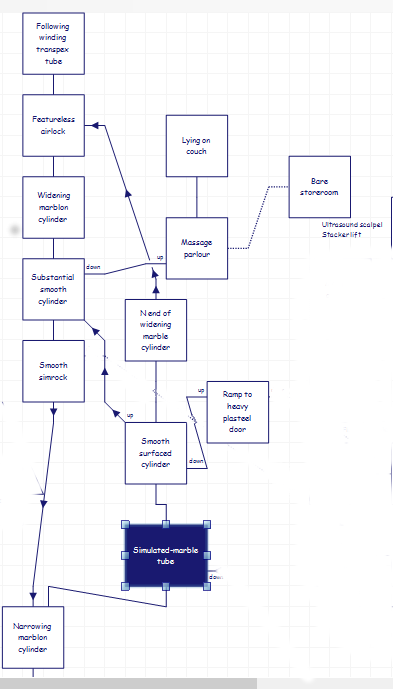 We’ll cover all three of the expanded Zork manuals at some point down the line. 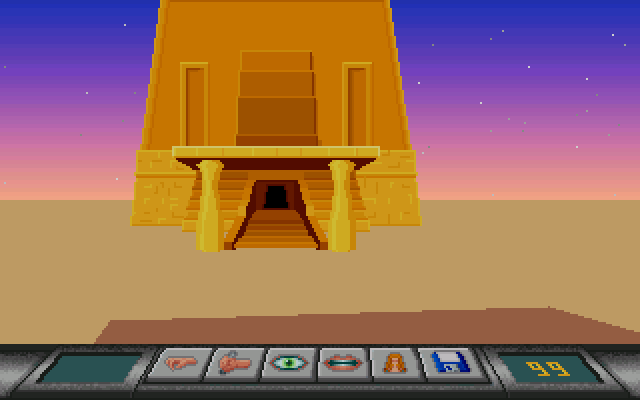 Full disclosure: I booted up this game as a kid but am fairly sure I didn’t play more than a handful of turns. In any event, I can remember nothing about it now.